Glasgow Warriors made it 13 home wins in a row in all competitions but they rarely shone against a Dragons side seeking a morale-boosting scalp. The Newport side led 9-6 at the interval, with Geraint Rhys Jones's trio of penalties edging out Duncan Weir's brace in the Pro 12 encounter. A second-half penalty try and two more Weir penalties put Glasgow in front. 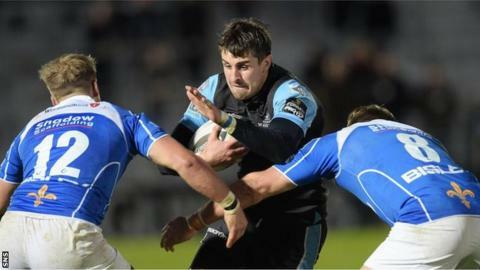 Dragons rallied late on but Glasgow held on for the win before next week's Champions Cup match in Toulouse. Rhys Jones and Weir exchanged penalties in a scrappy first eight minutes but the quality improved, particularly from the visitors, as the backs got the ball in hand and forced their way up-field. Rhys Jones knocked Dragons 6-3 in front with a penalty following a slick move down the right wing. But the home crowd were roaring their approval moments later when the Glasgow scrum forced the Welshmen back and Weir was able to ease the pressure with a kick into touch. Glasgow might have been hoping for a more dynamic performance, with Sean Lamont, Duncan Weir, Ryan Grant, Fraser Brown, Tim Swinson, Gordon Reid and Henry Pyrgos returning from Scotland duty, and DTH van der Merwe back from the Canada camp. And how better to return to winning ways after their loss at Scarlets last weekend than with a game against a team without a win in their last 11 away games in the Pro 12? But Dragons were playing with purpose and were worthy of their 9-6 lead after stand-off Weir and Rhys Jones knocked a kick apiece through the posts for infringements. Warriors summoned an almighty effort to force a try in the dying minutes of the first half. Dragons number nine Richie Rees was sin-binned as his team defended stoutly for almost four minutes just three metres from their try line, which they kept intact. At the resumption of play after the interval, an explosive run by Niko Matawalu, after seizing on a loose ball from a Dragons scrum, produced a five-metre scrum rather than a try. The television match official decided the Fijian was not in control of the ball as he slid across the try line having kicked the ball forward. Glasgow moved ahead for the first time in the game when they were awarded a penalty try beneath the posts as the pack outmuscled their opponents and Weir converted for a 13-9 advantage. Yet Dragons were gifted the chance to score when Glasgow were punished for offside and Rhys Jones made it four out of four with his boot. Rees came back on to reinstate Dragons to 15 players and for 20 minutes the teams were very evenly matched. Warriors coach Gregor Townsend sent on Pyrgos for Matawalu, Reid for Grant, Josh Strauss for Swinson and Pat MacArthur for Brown to freshen things up and a brace of Weir penalties underlined the Scots' gradual improvement in the game. Rhys Jones kicked over his fifth penalty of the match to set up a tense finale, which was heightened when Weir dropped the ball in his own 22, but his quick offload when over his try line prevented a dramatic late winner for the visiting team. Glasgow: Murchie, Jones, S Lamont, Horne, van der Merwe, Weir, Matawalu, Grant, Brown, Welsh, Swinson, Kellock, Nakarawa, Fusaro, Wilson. Replacements: Vernon for S Lamont (63), Braid for van der Merwe (73), Pyrgos for Matawalu (57), Reid for Grant (57), MacArthur for Brown (57), Fagerson for Welsh (80), Strauss for Swinson (57), Bordill for Fusaro (73). Newport Gwent Dragons: R Jones, Prydie, Wardle, A Smith, Pewther, Tovey, Rees, Harris, Dee, Way, Hill, R Landman, J Thomas, Cudd, L Evans. Replacements: Amos for Pewther (73), J Evans for Rees (67), Price for Harris (61), R Thomas for Dee (55), Fairbrother for Way (70), Benjamin for Cudd (66). Not Used: Coombs, D Jones.